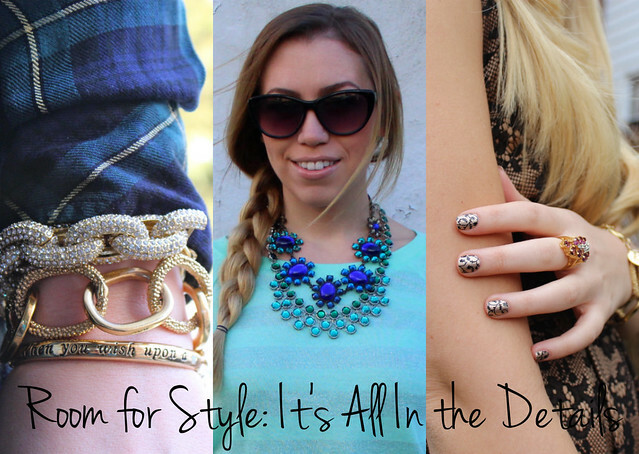 2nd edition of Room for Style & we’re talking about details!! #1 This is a Master Bedroom that I worked on. In the top & right photos you see how I layered the window treatments to help give the large windows some dimension and warmth. 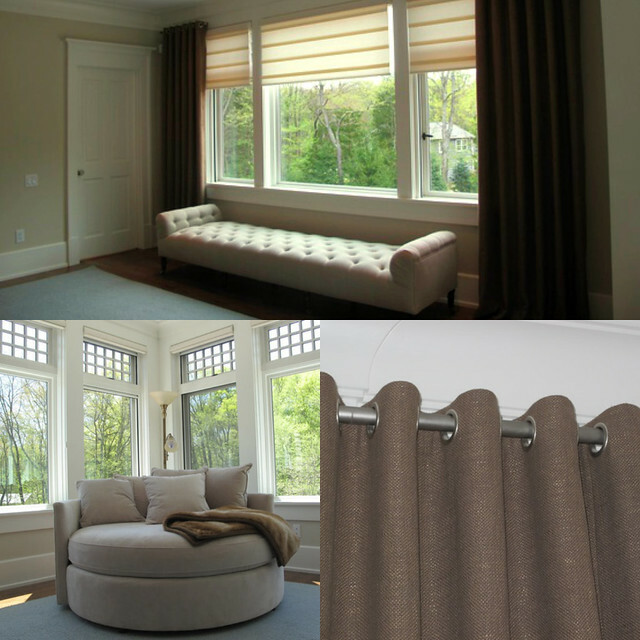 Hunter Douglas Vignette Roman Shades shown with Custom Grommet Style Drapes. I used Robert Allen fabrics & decorative rods from Seabrook, then placed a large tufted bench in front of the window to finish the look. The right photo shows the sitting area of the bedroom where I used an interesting round oversized chair by Mitchell Gold. This piece allows the client to curl up with her favorite book and relax. #2 This living room is a mix of Contemporary & Rustic styles which makes the room very inviting to relax in. In a room like this you appreciate the time spent in the details. The cocktail table is a mix of metal & raw wood and is very well accessorized with a wire basket with books below & flowers and candles set on top of a metal tray. 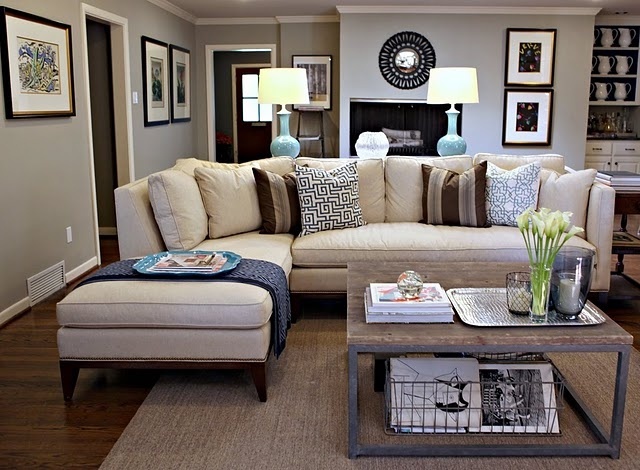 The clean line sofa has a nice array of textured & patterned pillows and a simple throw. The artwork varies in size and content, but all have a comment element, black frames Then the last few details in the room such as the area rug, a interesting mirror above the fireplace & the unexpected pair of blue lamps behind the sofa add to the very well put together room. #3 Most people don’t realize the impact a window treat has on a room. It’s like getting dressed up and not wearing any accessories. 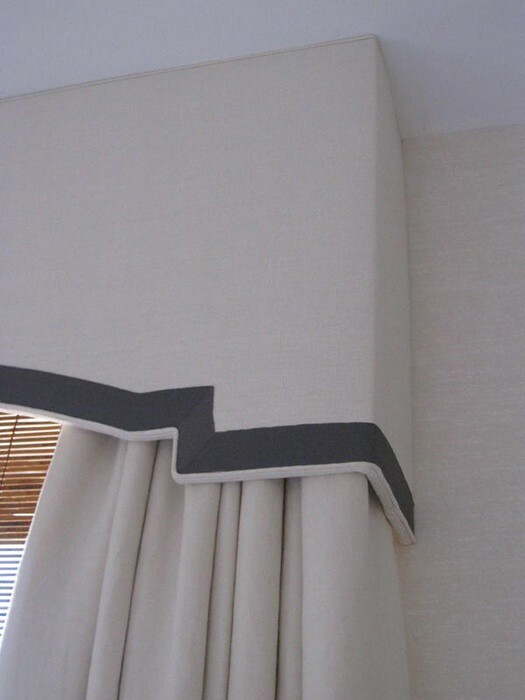 The detail on this custom cornice is simple and adds interest to a window treatment. For girls that are as Obsessed with Accessories as me every outfit really is “All About the Details.” The bag, the sunglasses, the jewelry, the nails, the makeup…these elements are what makes an outfit an outfit! They pull the clothes you’re wearing together and make it look like you actually tried. Even if you’re not all about the statement pieces like I am, the addition of a simple necklace or a great swipe of lipstick can make the world of a difference in your overall look! Missed out first Room for Style post? 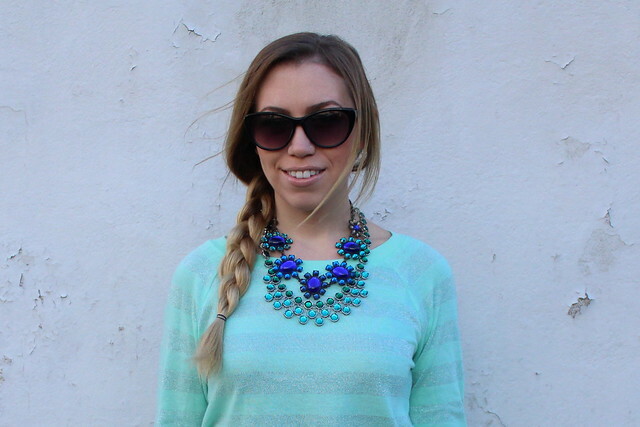 Check out our Room for Style: Monochromatic post! that living room looks so well put together – aesthetically appealing, but still feeling totally liveable. Such a posh living room . You are right that window treatment would really help set the tone of the room. 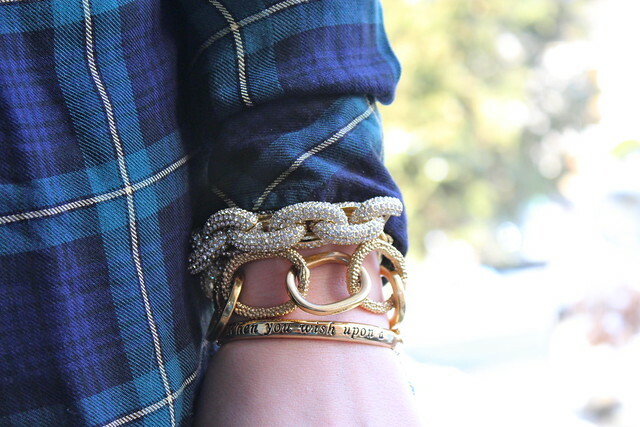 I love that Mark bracelet, it looked great alongside the other link bracelet. The price point is also great! The J Crew one is just way too much!